I hope that you all had a wonderful New Year’s Eve and enjoyed celebrating the start of 2013! Our evening was pretty low key this year – I’ve had a nasty stomach virus the last few days, so we just stayed home, watched a little bit of television and then went to bed early. But hey, I’m feeling better so I’ll take it! I made this homemade hot chocolate mix to go in my holiday gift baskets and have been waiting patiently to share this recipe with you. 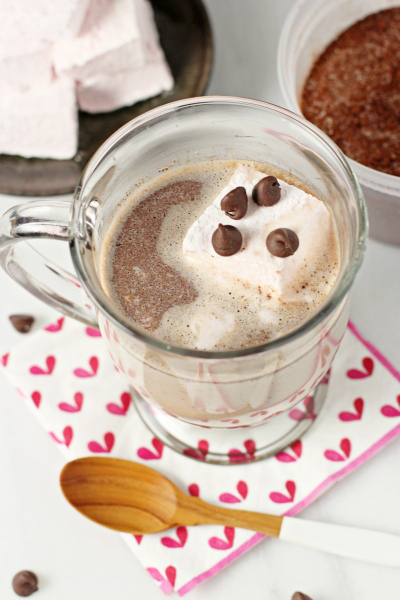 I know that the gift-giving season is over, but trust me, you’ll want this hot cocoa around for yourself for all those cold and snowy winter days ahead. This mix is packed full of lots of chocolate, giving it a wonderfully rich taste. Recipe for homemade hot chocolate mix. Made with semisweet and dark chocolate plus vanilla beans. Perfect for gift giving! Add the granulated sugar to a medium container with a lid. Split the vanilla beans lengthwise and scrape out the seeds. Add the seeds to the container and use your fingers to work them into the sugar. Take the vanilla bean pods and bury them under the sugar. Cover tightly with the lid and let sit overnight at room temperature. In the bowl of a food processor, add the chopped semisweet and dark chocolate. Process, using 4-second pulses, until finely ground. *I did this step in two batches (half of the chocolate at a time) since it is a large quantity. Transfer the ground chocolate to a large bowl. Remove the vanilla bean pods from the sugar. Add the sugar to the large bowl. Next add in the Dutch-processed cocoa powder. Whisk together until well combined. Store the hot chocolate mix in an airtight container for up to 6 months. 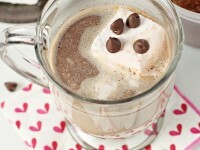 To serve, stir two tablespoons (or more, to taste) of the hot chocolate mix into 8 ounces of hot milk. Mix until well combined. Garnish with whipped cream or marshmallows, if desired. Barely adapted from Confections of a Foodie Bride. Originally from Epicurious.